Obviously these guys are painted black. In this case, I went with a nice clean edge highlight and it's going to be the route I go with my Deathwing unless I discover some new fancy method to use between now and when I start painting in a couple months. With all my recent experimenting, it's a highly refined version of my very first approach. I covered their bases in an earlier post and I like to think I did a pretty good just of emulating the resin base I had to work with in the beginning. I like to think I managed to avoid the dreaded Christmas tree effect as well with their red bolters and green shoulderpad trim. I kept both colors somewhat muted to go with the dark armour overall and I think they stand out just enough, but don't contrast so much as to draw undue attention to them. I think the light basing really helps set the models off too. The bases were kept light overall and don't have any real dark areas. They're an exact opposite to the models themselves since they are lacking any real super bright highlights. The muted colours are great, but... haven´t they their shoulderpads swapped?? I think I need to retake my Raven Guard soon. I even thought of doing a second drybrush with the color of the final highlight trying to simulate the light, but i think this will make the mini so much grey for my idea of the raven guard. Sorry for being later and for paste links in the comment, but i think you can be interested in to take a look. Another question... How did you do the green trims?? 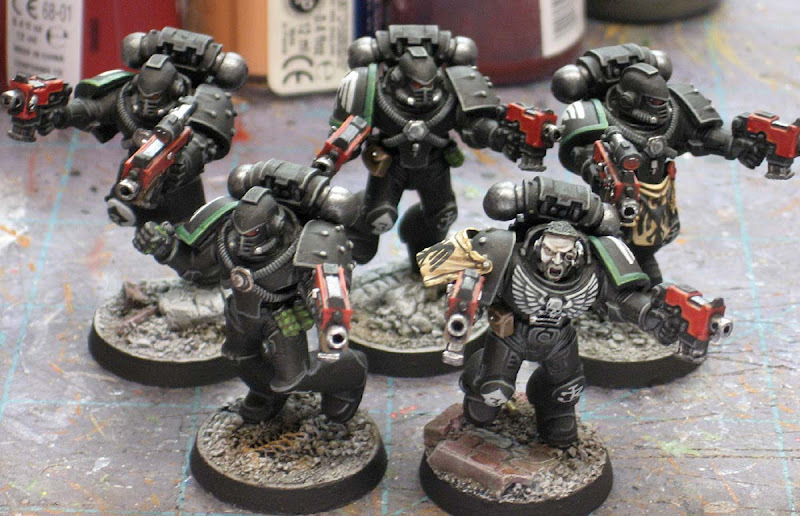 I'm really loving the look of them... As you would expect with the Raven Guard, even the Tactical Squads are dynamic and in action. I had to look twice at them to make sure they were tactical and not assault but I can just see them making their way across the battlefield, hitting and running as is their want. I can't wait to see more and also to see you bring the painting skill to your new Deathwing. Make one doing a flip! Looking good. The face on the Sergent is awesome. I really like the bases. You may want to match the bottom of the base with a similar color, the dark band almost looks like its unpainted and draws you eye away form the fig. Very dynamic miniatures, and a lovely paint job on top mate. Looking good mate. I really love those helmets. I'm probably showing my noobness but are they forge world? Very nice looking RG Ron, I remember your earlier RG stuff and at the time thought it looked pretty damn too. Thanks for the painting black posts you did a little while back, really helped. Any more RG stuff to expect soon? Grajo: Thanks for the links, I went back and added them to the previous post. Lord Shaper: Now that I have my painting down, I'll be working on some sculpting for my Deathwing first. I'd like for each guy to have a unique suit of armour since there are only ten of them in the force. Look for those ideas to be posted in the coming weeks. Gothmog: These guys actually came to me already built. At first I wasn't a big fan of all the action, but I'm really starting to like the dynamic look of the squad overall. Paint My Figs: Good point. Didn't notice that until you said something. I guess in real life it just looks "right." Fridge: Thanks. At first, I was worried it would make them look like cartoons. The more I paint them, the more I like the contrast of the red gun cases. And I didn't paint the whole gun case red either, just a small portion of it. 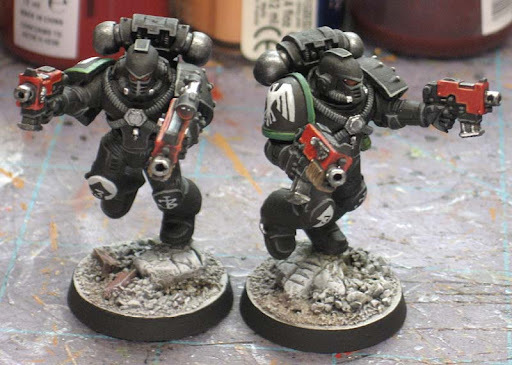 FromtheFang: Yes, they are from Forge World, but I do not know what MK they are. That would be my noobness coming through. Anon: Glad they helped. The next time I post about these guys, it will be the other half of the squad. After that, I've got a drop pod to do for them. How did you get that great muted red on the bolters? Mr.Esty: Funny you should ask that. I took some photos of the step by step process and the colors I used to get it. I'll get it posted in the coming week then. It's fairly easy, but I've started looking for alternative methods. On large areas it might be a bit time consuming. I think these guys look really good. When I paint Death Company, I do direct highlights in Shadow Grey and just tint them with thin glazes of Badab Black till it looks right. On a totally unrelated note, did the price of Citadel Colour paints go through the roof or something? On their website they are listing paint pots for $6 a piece. Is it just me, or is that double the old price? The Harrower: You know, you're not the first person to mention doing that. Seems like a number of folks use that technique to "blend" their highlights. I'm going to have to give it a go to see how it looks.As for the paint, I don't know... I buy so few paints, I couldn't tell you what I pay for them honestly.